Every season, Coach refreshes its lineup of Apple Watch bands to account for the season. Just a couple months ago, it dropped a batch of bands for the summer. Get your pumpkin spice lattes ready, because Coach is now celebrating fall with a selection of new seasonal bands, first spotted by Haute Ecriture. Specifically, there are two new bands and two new colors: Cadet and Crystal Tea Rose. The Cadet is a navy burnished glovetanned leather strap that's relatively simple for Coach, sporting no designs or print. The Crystal Tea Rose is very similar to Coach's existing Tea Rose straps but with crystals on the flowers instead of steel. Unlike the Cadet, the Crystal Tea Rose come in two colors: pink and teal. 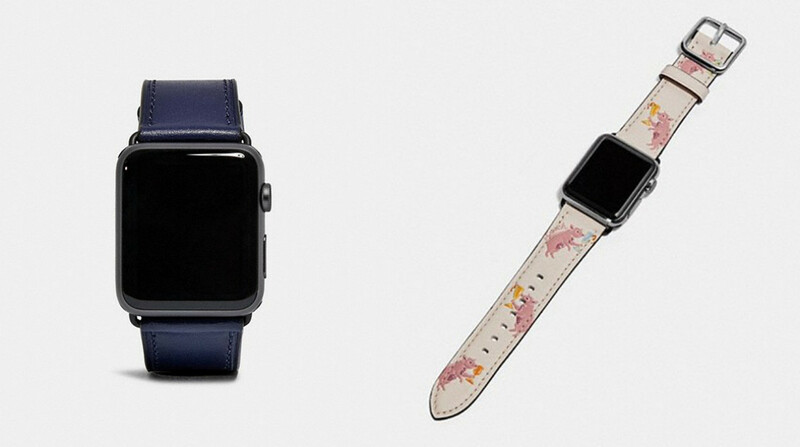 The Apple Watch Strap with Prints is getting two new colors: Rose Print and the hilariously-titled Pigtini Party. Rose Print is a dark red glovetanned leather with pink roses and the Pigtini Party is a glovetanned leather strap with, erm, a pig holding balloons. You're also going to be able to buy Coach Apple Watch bands from Orchard Mile, which marks the first time the bands will be available from someone other than Coach online. However, you'll only be able to buy older Coach bands, not the new ones. As for the new ones, you'll be able to get the Cadet for $150 while the Crystal Tea Rose will set you back $195. As for the new Strap with Prints, you'll still be able to get them for $150 each.